5 Dangers Associated With Drinking Alcohol You Don't Know About But Should! 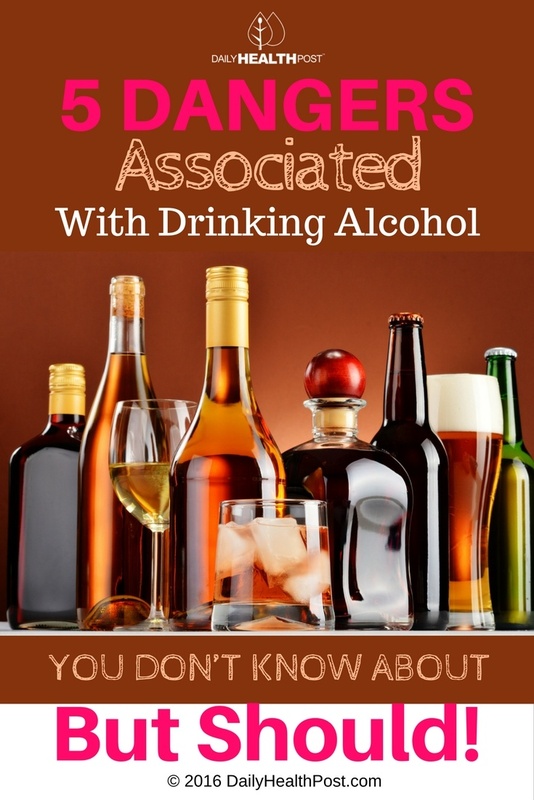 5 Dangers Associated With Drinking Alcohol You Don’t Know About But Should! Sipping on a cocktail is an easy way to melt away the stresses of your day, but it comes with a hefty price: excessive drinking is the direct cause of roughly 88,000 deaths a year (1). It’s estimated that alcohol decreases the lifespan of drinkers by an average of 30 years. Considering that 63% of Americans drink beer and wine regularly, alcohol-related diseases has truly become a public health concern (2). Alcohol is one of the most widely used drugs, and while some spirits have their benefits, they’re certainly not without risks. Excessive alcohol consumption is known to cause cancer, particularly of the head, neck, esophagus, liver, breast, and colon (3). That’s because alcohol (ethanol) is converted by the body into a toxic chemical called acetaldehyde. This chemical damages DNA and prevents cells from repairing themselves. 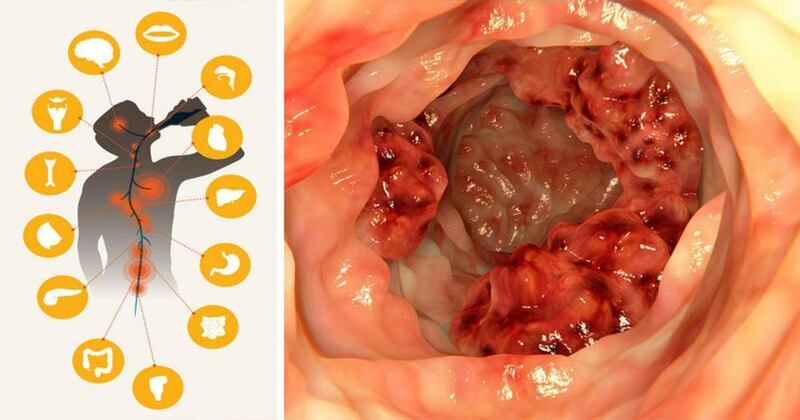 It also causes faster-than-normal liver cell turnover, leaving them more prone to being damaged. Alcohol inhibits the absorption of anti-cancer nutrients like vitamins A, B, C and D as well Folate. Osteoporosis is a bone disease characterized by thinning bones and increased fractures (4). It’s typically experienced by women after menopause, but can earlier in life and may affect men as well. “Alcohol interferes with the pancreas and its absorption of calcium and vitamin D. Alcohol also affects the liver, which is important for activating vitamin D — which is also important for calcium absorption.” (5). Alcohol also affects hormone balance, decreasing estrogen to dangerously low levels. Estrogen is important for bone maintenance and density, which is just another reason why you should skip out on your second glass of pinot noir. Other hormones at play include cortisol and the parathyroid hormone, which increase with regular alcohol consumption and both increase calcium leaching and bone loss. Alcohol is often used to temporarily treat anxiety and stress, and while it may leave your feeling relaxed and sleepy, it won’t actually make you feel better. Serious alcohol abuse and depression do hand in hand : approximately one-third of people with major depression also have an alcohol problem. That’s mainly because depressed people are more likely to drink. Alcohol acts as a depressant, meaning that it can worsen depression (6). Alcohol also damages the brain and can lead to depression. Essentially, although alcohol is a drug, it should never be used to self-medicate or escape reality. Alcohol really does make you thirsty, and it may be the cause behind the dreaded handover headache (7). One of the ways it works is by decreasing your body’s production of the anti-diuretic hormone, increasing you urine production and effectively dehydrating you as the night goes on (8). If you experience any of the following symptoms, put down the beer and swallow a few glasses of water instead (9). Alcohol is metabolized by the liver, making it the first organ to take a hit as you pound back the drinks. Alcohol damages and even kills liver cells when you consume more than your liver can handle (10). The more you drink and the more often you sip on a high-alcohol drink, the more likely your are to develop alcoholic fatty liver disease, alcoholic hepatitis, and, eventually, cirrhosis (liver scarring) (11). As alcohol tolerance increases with time, the quantity of alcohol needed to damage your liver may not even be enough to get you drunk, so it’s best to abstain from alcohol as much as possible. Current guidelines in terms of drinks are no more than 7 glasses of wine a week for women and 14 a week for men. Latest Headlines » Wellness » 5 Dangers Associated With Drinking Alcohol You Don’t Know About But Should!